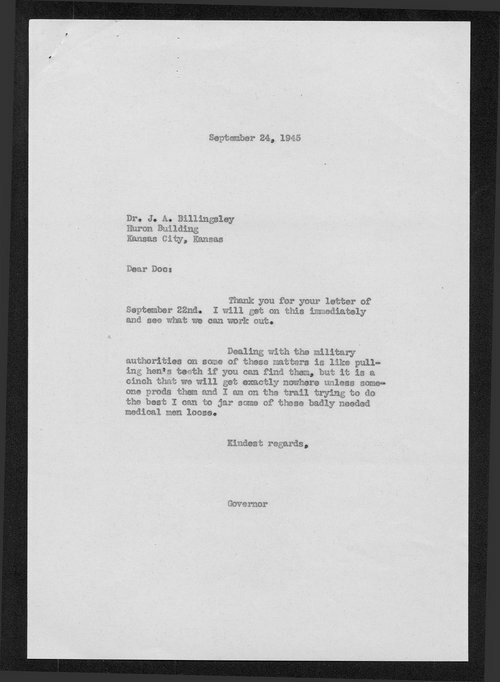 This correspondence between Governor Schoeppel and Dr. J.A. Billingsley deals with the severe shortage of doctors that Kansas faced throughout World War II. In his letter to Governor Schoeppel, Billingsley explains that his assistant, Dr. John Betz, has been in the military for three years despite health problems. As a result, Dr. Billingsley has had to rely on the help of "two men who are both past sixty-five and are unable to carry the load." This item can be used to provide students with insight into the ways in which World War II impacted the American home front.